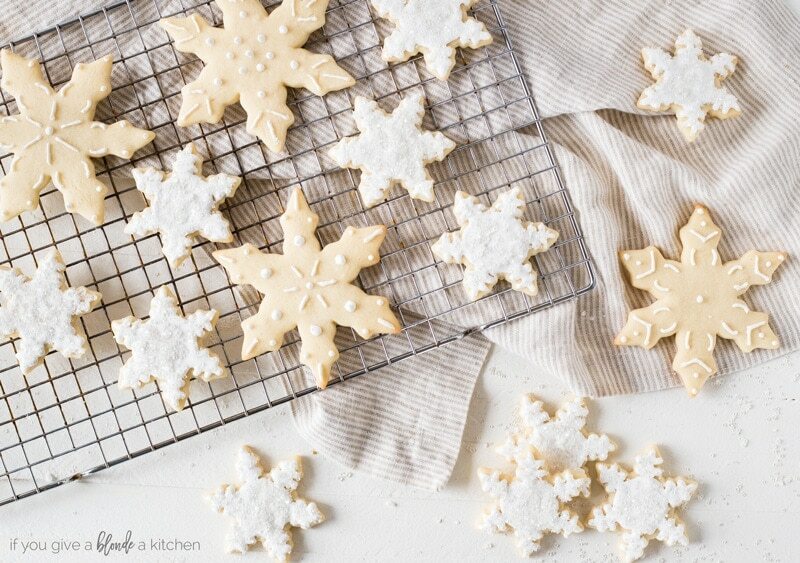 Snowflake sugar cookies with royal icing will put you in a winter mood. The sugar cookie dough requires no chilling! I am one of the few people who really loves snow. Like, really loves it. 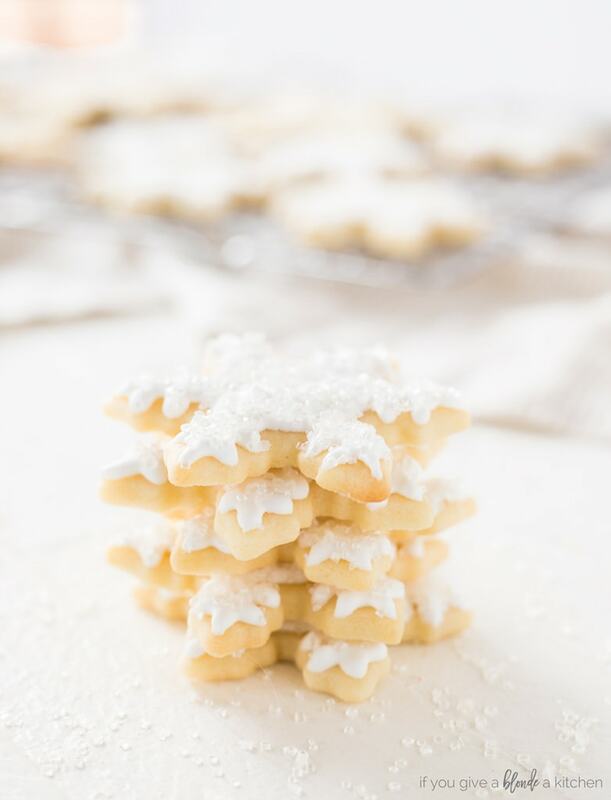 I’m hoping to see some flakes soon in Connecticut, but for now, I’ll settle for these snowflake sugar cookies. 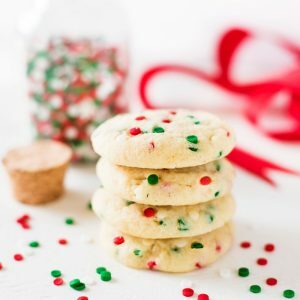 This sugar cookie recipe has been my go-to for years. It hasn’t failed me yet. The dough requires no chilling and yields dozen of cut-out sugar cookies. 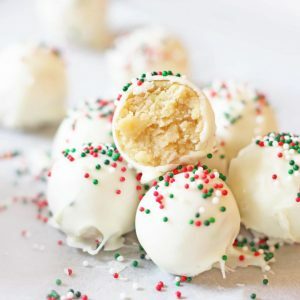 When I make this sugar cookie dough, I almost always use almond extract. It is my kryptonite. I can’t resist any dessert with that flavor! Have you tried my Scandinavian bars? Of course, if I’m baking for friends who have a nut allergy, I swap out the almond extract for vanilla. The cookies still taste amazing, especially if you use the good vanilla. I like to use vanilla extract in the icing as well. Almond extract tends to have a more powerful flavor so when the icing melts on your tongue the vanilla is always a better flavor in my opinion. 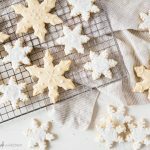 Along with this sugar cookie dough recipe, the royal icing recipe has also been a go-to for a while. I always get a good piping consistency and it dries hard rather quickly. The key ingredient here is meringue powder. Meringue powder can sometimes be hard to find. Try your local baking store or order some on Amazon. Yes, there are royal icing recipes that don’t have meringue powder, but the icing takes forever to dry. My advice, stick with meringue powder. It has a long shelf life (up to two years). So if you make icing a few times a year, it will be worth it. As I was saying, the royal icing dries hard and quickly, which means once I create a pattern on the snowflake sugar cookies, it stays. I can take a look at all the cookies lined up next to each other and see how unique they are—just like real snowflakes! For the smaller snowflake sugar cookies, I like to frost the entire cookie and top with sugar sprinkles. It gives them a glistening effect similar to snow. While I love all my cookie cutters around Christmas time, I am especially fond of the snowflakes. I can really let my creativity loose making each snowflake unique. 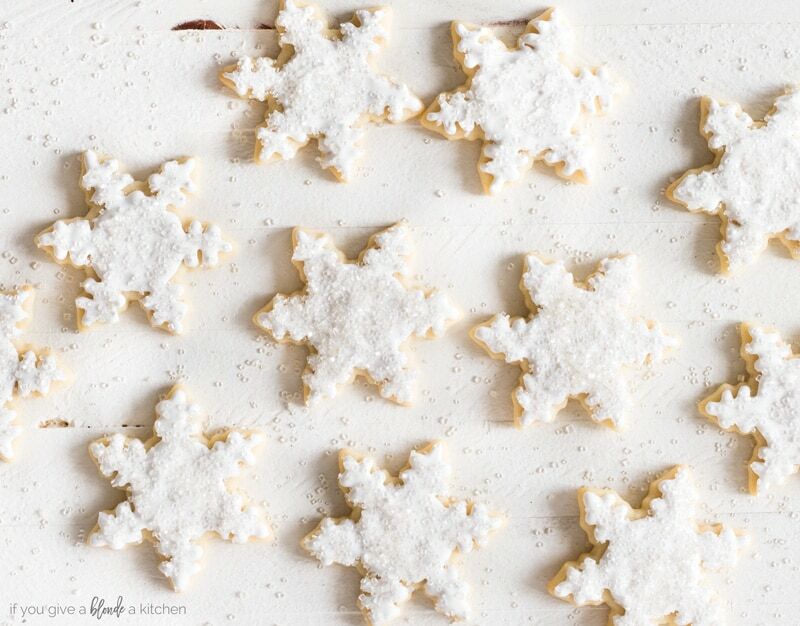 Tag @ifyougiveablondeakitchen if you make these snowflake sugar cookies. I’d love to see how creative you get! 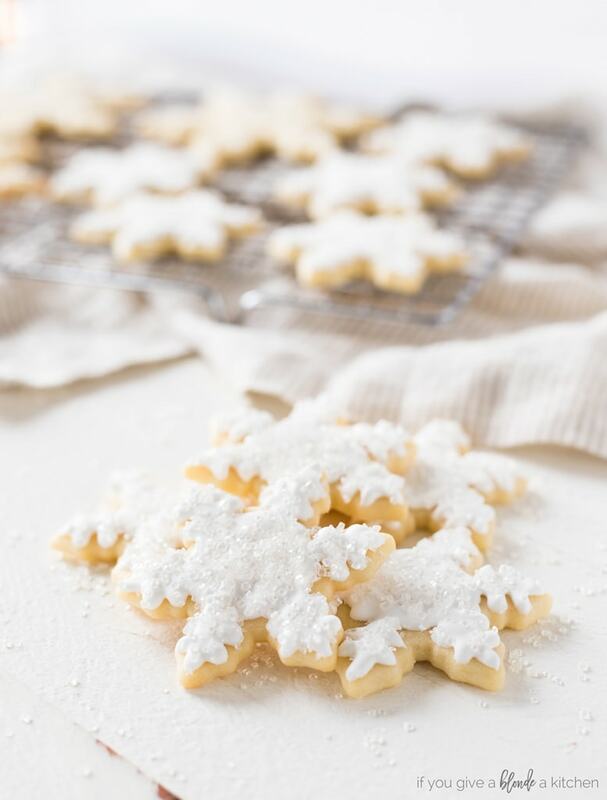 Snowflake sugar cookies will put you in the mood for a white Christmas. Decorate with royal icing and sprinkles to make each cookie unique. In a large bowl of a stand mixer (or using a hand mixer), combine butter and confectioners' sugar until light and fluffy, about 2 minutes. Add the egg and vanilla, and beat until thoroughly incorporated, about 30 seconds. Scrape down sides of the bowl as necessary. With mixer on low, slowly add flour mixture to the bowl. The dough is ready when most of it sticks to the paddle. When touched, it has a little give, but does not stick to fingers. Flour the work surface and roll dough to about ¼-inch thick, using flour for dusting as necessary. 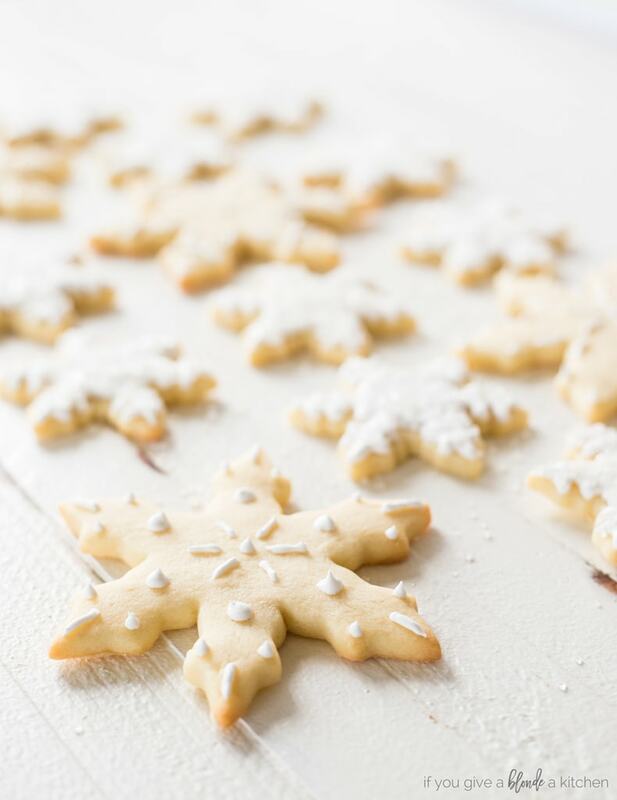 Use snowflake cookie cutters to cut cookies and place on prepared baking sheet.¹ Gather scraps and reroll dough when necessary. Bake for 7 to 8 minutes or until the edges are set. Allow cookies to cool on baking sheet for 5 minutes, then transfer to wire rack to cool completely. Place the meringue powder and water in a large mixing bowl, and whip with the whisk attachment until foamy, about 3 minutes. Add the powdered sugar and whip on medium speed until very stiff and thick, about 3 minutes. The royal icing should hold a stiff peak. If necessary, thin with additional water, a drop at a time, to get the desired consistency. Transfer icing to an icing bag fitted with a small round tip (I used Wilton #2). Ice the cookies and decorate with sprinkles if desired. If using different cookie cutter shapes, place cookies of similar size on the same baking sheet as they will bake at the same rate. 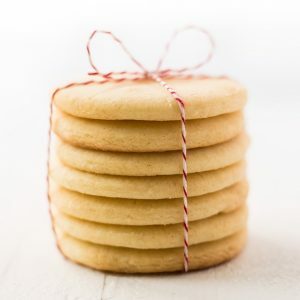 Store iced sugar cookies in an airtight container at room temperature for up to a week. Sugar cookie dough can be stored in the refrigerator for 2 days or plastic wrapped in the freezer for a month. Defrost dough in the refrigerator before letting come to room temperature and baking.